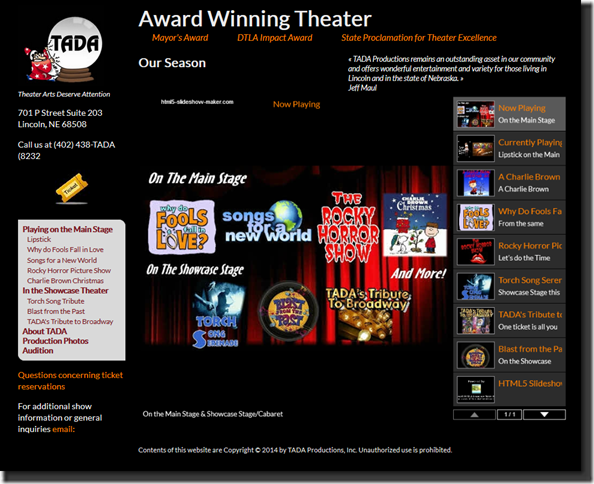 Our Day 4 redesign is TADA Productions, a non-profit theatre in Lincoln, Nebraska. The first impression we had when viewing the site “hello 1998”. The ticket images for the menu are sort of cute but reminds me of something you’d see at a production in the church reception hall, not a professional company. There are so many issues with this site that this review can only touch on the worst issues with the site. Like many people I have a high resolution computer screen and found the text hard to read. The theater address is in such a light font it broke up while the last line of text was so small as to be impossible to read. As a result I went to resize the text using my browser tools (Firefox “View > Zoom > Text Only, Internet Explorer “View >Text Size”) and nothing happened. On closer inspection I discovered that almost all the text on the page is contained in an image. 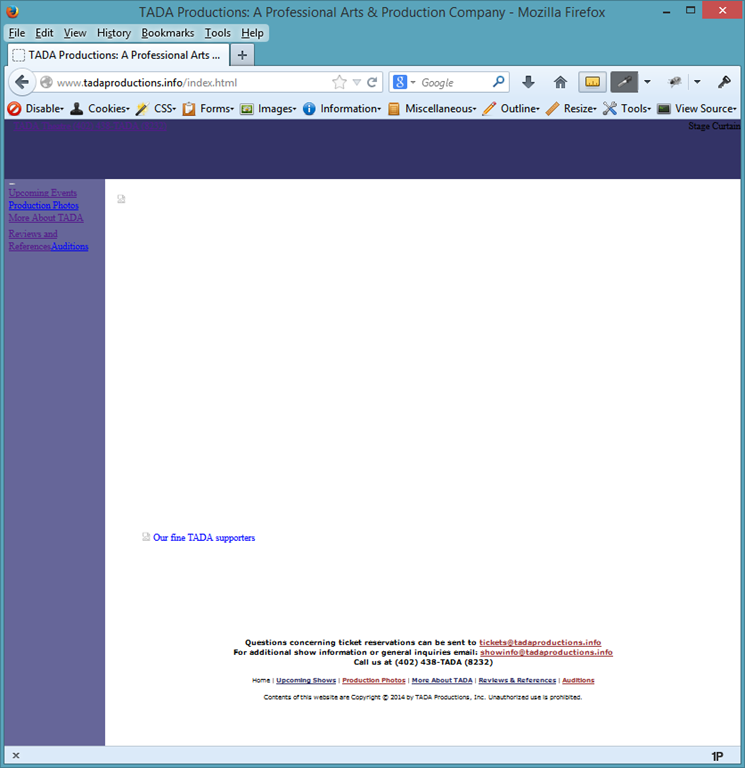 Accessibility – as you can tell from the image to the right without images there is no content for the visitor. While some site owners might say, “so what, blind people are not my target audience”. But many people who are sighted browse with the assistance of screen readers either because they have dyslexia or find reading text difficult due to a physical condition such as macular degeneration. Besides which most governmental entities from municipal governments all the way up through the state and federal level have accessibility requirements. While they can’t force a personal site to be accessible if you get any sort of federal, state or city money accessibility is part of the package for grant money. Even many art councils and other funding sources require that those they fund be accessible to the disabled including both physical premises and websites. Google, Bing & other search engines - are the biggest and often most important blind person looking at your website. Looking at the screen capture above right to see exactly what search engines and anyone else who can’t read the content from images sees when they visit this site. 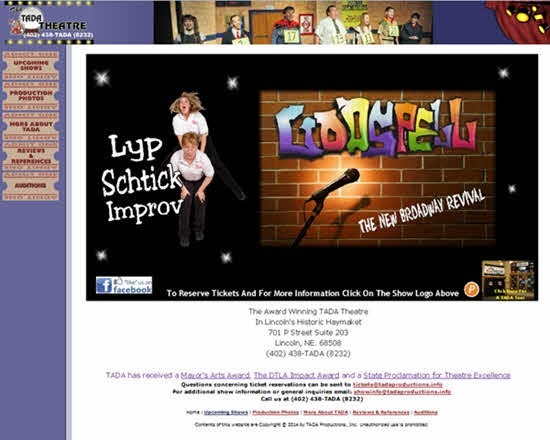 Search by production name for plays in Lincoln, Nebraska and this site doesn’t show up in either Google or Bing though their facebook page did. Framesets like the one used on this site not only went out of use over a decade ago they prevent the visitor from being able to bookmark an individual page such as a particularly play they are thinking of attending. It also means they can’t send a link to a friend to encourage them to attend the play either. Besides there is absolutely no reason using modern template methods that the exact same look could not be done without using frames. Get real content on each page, and by real content we mean text as text. That way people can actually read about the theater and its productions. 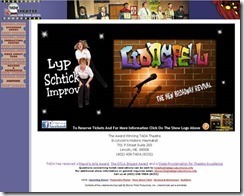 Search engines can find the site, index the productions and let people find the site. This could easily be done without changing the look/feel of the site hardly at all as you can see from the screen shot of a minimalistic makeover that uses the same design elements but brings content to the forefront in a useable format. While the site still looks like a 1990 something website removing frames and putting real text instead of all images or worse yet images of text makes the site far more visitor friendly. 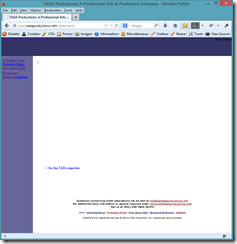 Bring the site out of the 1990s and get rid of the flash header. 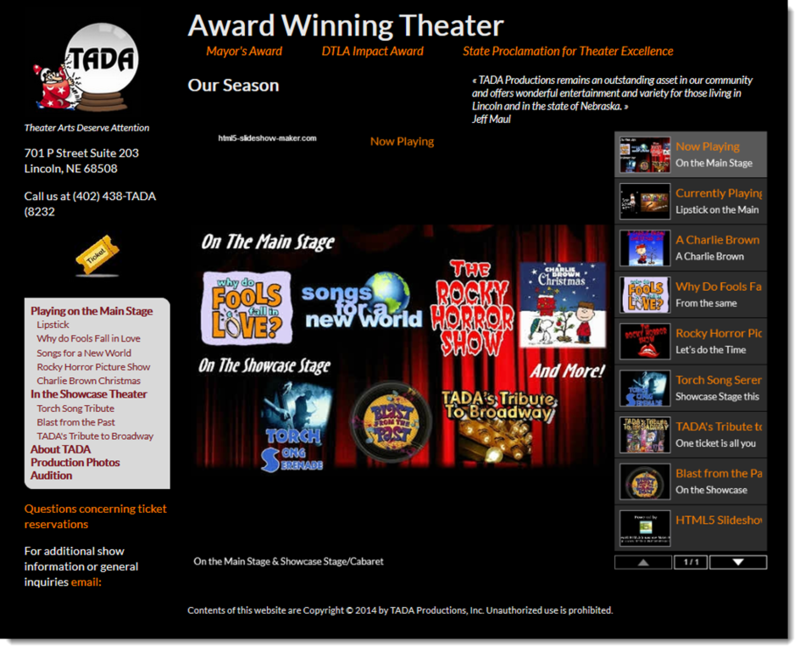 Put a slide show that has each of the productions with information about the production on the slide in plain text. 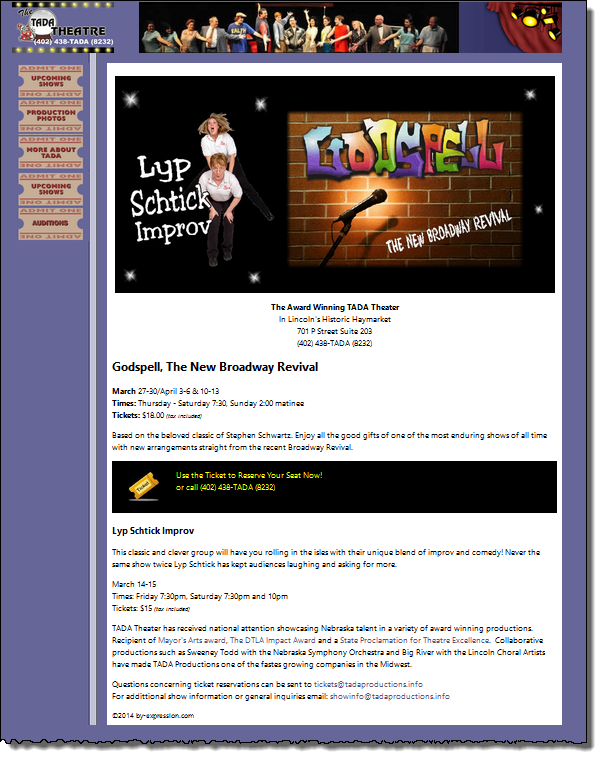 I chose a different slideshow from the one used on the astronomy site just to feature a different type but the exact slideshow that would best showcase their upcoming productions is up to the theater. The html5-slideshow-maker used is the free version with credit both in the head section and in the last slide so if one of its 60 templates is used I would suggest purchasing the application to remove those credits and give you a few more customization options. At $14.95 (mac) or $19.95 (windows) for a full license the price is certainly reasonable for the function it provides.